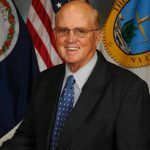 ​Paul Ebert, Virginia’s longest-serving Commonwealth’s Attorney with more than 50 years of service, announced that he will not seek reelection in 2019. Ebert practiced law privately for several years before he became a part-time Assistant Commonwealth’s Attorney. In 1968, he became Virginia’s youngest elected Commonwealth’s Attorney.